Home / Automotive / Car News / MINI Cooper Hits The Slopes! MINI Cooper Hits The Slopes! 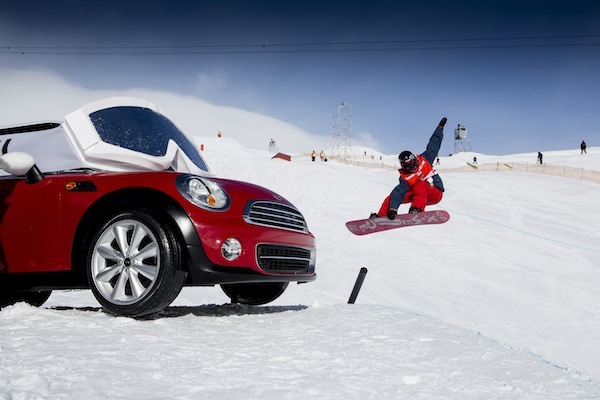 by Sekouupdated on Leave a Comment on MINI Cooper Hits The Slopes! MINI is pleased to announce that its multifaceted partnership with Burton Snowboards is set to continue for an additional three years. MINI, a partner of the world’s leading snowboard manufacturer since 2011, shares Burton’s passion for snowboarding and is committed to progressing the sport. Since their partnership began, MINI and Burton have created world-class snowboarding competitions and events around the world, including the Burton US Open, the Burton European Open, Burton Rail Days in Tokyo and the Burton High Fives in New Zealand. This continued partnership will enhance both companies in their efforts to reach more people who live the snowboarding lifestyle. “We’re delighted to add another chapter to the success we’ve enjoyed together over the past two years and to have found, in Burton, a trend-conscious partner who will join us in supporting young and creative people and their sport,” emphasized Dr. Kay Segler, Senior Vice President MINI Brand Management. As the presenting partner of the Burton Global Event Series (BGES), MINI will join Burton in the United States, New Zealand, Japan and Europe to produce world-class snowboard competitions that include art installations, creative contests and entertainment events. The first European date on the tour was the Burton European Open in Laax, Switzerland from February 4th – 9th, 2013. During the event, crowds witnessed MINI’s “Creative Use of Space” philosophy, a unique art event with a MINI Countryman featured inside a large glass container. For the art event, the MINI Countryman was given a creative makeover by snowboard artists of the PirateArtCrew while the snowboard action at the Burton European Open went on around it. Additionally, the MINI Test Drive Center in Laax gave visitors the opportunity to test-drive models from the MINI family. Next up is the Burton US Open Snowboarding Championships presented by MINI taking place in Vail, Colorado from February 25th – March 2nd, 2013. For the second consecutive year, MINI is bringing back the MINI Feature Award, a competition between the slopestyle course designers for the Burton European Open in Laax and the Burton US Open in Vail. The award gives $5,000 to the crew that builds the most creative slopestyle feature that includes a MINI in the design. In Laax, the slopestyle shape crew led by Roger Heid created a pole jam hit into an 18-foot halfpipe that featured a MINI in the background. During the Burton US Open next week at Vail, Snow Park Technologies will do their best to win the MINI Feature Award with their own creative slopestyle feature. 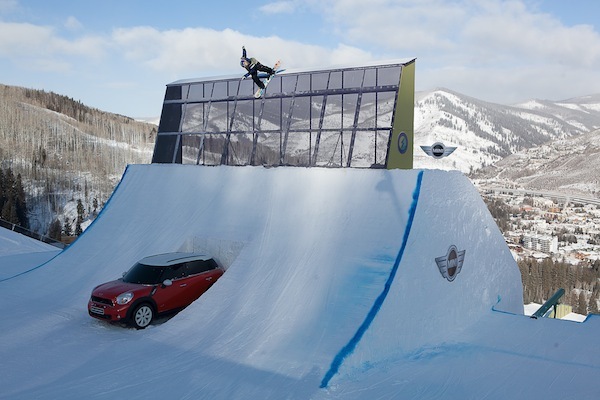 In addition to the top snowboarding competitions in Switzerland and the USA, MINI will be slopeside for the 2013 Burton High Fives event in New Zealand and the 2013 Burton Rail Days in Tokyo. Beyond this, the brand is also a partner of the Burton Mountain Festival series in the USA, as well as the Channel Island Surfboards Demo Tour, which takes place on the East and West Coast.